The Avengers, prisoners of war! Betrayal in the Galactic Council. 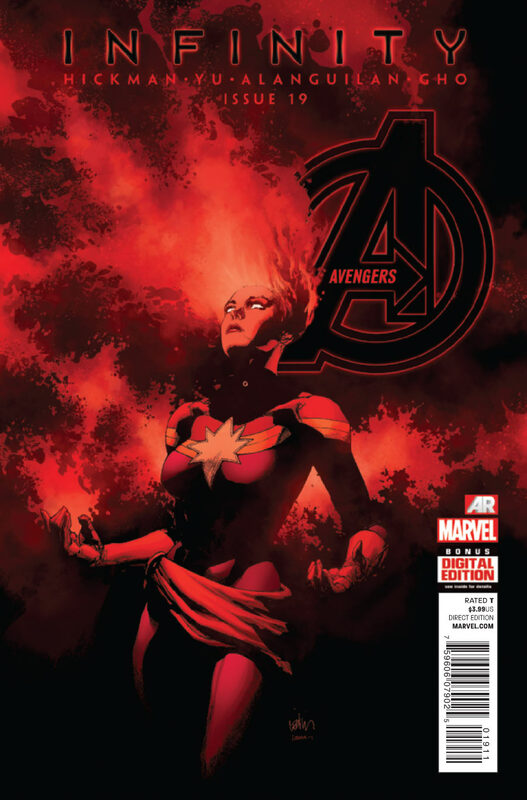 Cover– Carol Danvers bathed in red hues, hair aflame like when she was binary with the Infinity banner neatly splashed across the top. Interior Art-Leinil Francis Yu is on art duty and it is pretty awesome! Pencils, inks and colors are beautifully rendered and realized. The art does a very good job of contrasting the vast emptiness of space and the gardens of the ring world grown by Ex Nihilo. The War– So in light of Infinity #1 and Infinity #2 half of the Avengers (2013) squad has been captured by the enemy and Captain Marvel questioned about why Earth possesses Abyss Ex Nihilo’s female companion who apparently is supposed to be of an extinct breed; a Nightmask, Starbreaker and even the living embodiment of the universe “Captain Universe”, who they rejected so long ago. Elsewhere what remains of the Avengers team a rally with the galactic council to plan how to counter act the invading forces. One member betrays them by trying to make a deal with the Builders his request is denied but serves to give away the teams location. Black Heroes– Nightmaskis in a pod out of commission while Manifold is helping out the injured refugees. Strange Bedfellows– This war is proving quite interesting with the Kree sticking up for the human race and the builders straight out denying the truce with J-son all make for good reading. I’m also fascinated by the politics at work throughout the book because of the many races that have all been forced together. Action– One thing about this crossover that I love is how much seems to be taking place and the gravity of the situation unlike the AVX crossover which was very localized to Earth and specifically the Avengers and X-men brands. Weird- Not sure why the female Ex Nihila has a sexualized pose with Captain Marvel that did not enhance the story in any way but who can tell with these things. I know I know! I’m weird. I don’t know why it was there either. But man… I loved it.